What actually prompted me to watch Santa’s Slay was an article. When you list a movie as being so bad it must be seen then I’m interested, regardless of that fact that an evil Santa is already of interest. I must say that I am most grateful for that article for finally convincing me to see it. Now I will say this it while it doesn’t make the grade as a good movie it is also not a waste of time and rather enjoyable as a bad film, it’s not Troll 2 but then again what is? Now most of why I can’t go there and say this film is good is the story which while original is lacking. Let’s put it this way Santa has been prevented from going on a homicidal rampage for 1000 years because he lost a game to an angel, a game which can most accurately be described as curling, while I have come to love curling had I known the fate of mankind hinged on it I would’ve started watching it at a younger age. It’s hard to tell whether that’s so bad it’s good. Yet, Santa is also a demon and the result of an immaculate conception which was initiated by, in my best Church Lady voice, Satan! The dialogue is also a double-edged sword some of it is very tin-eared, all of Santa’s lines are a punny mess but some are home runs and absolutely hysterical. The casting in certain places is very off. The opening scene is a who’s who of “Really? 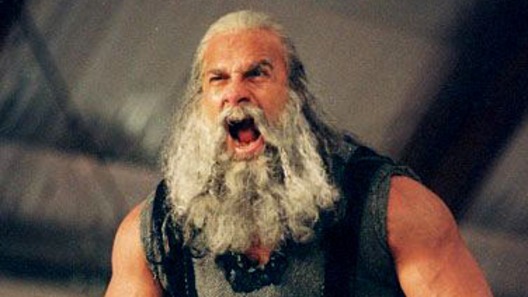 You’re in this movie?” featuring James Caan, Fran Drescher and Chris Kattan but for some reason Santa is played by wrestler-turned-actor Bill Goldberg. Yet the cast isn’t without its highlights like Douglas Smith as the hero. Smith who has always done very well with whatever part he’s landed but just hasn’t gotten anything as high profile as his older brother Greg. There is a countdown, which due to the actual short running time of this film, seems a bit rushed. However, that’s the only real issue of pace. If there’s one thing you can give this film without qualification is that it doesn’t have any struggles with pace at all. Another bonus in this film is, while it’s not particularly well done, there is a little Rankin & Bass style animation sequence to illustrate the backstory of Santa and the Angel’s agreement. And, yes, it does need to be said that some of the kills are quite good and funny so this film does keep a sense of humor about itself and doesn’t have any pretensions about it which makes it watchable and to an extent enjoyable.